Easy to make CHICKEN ENCHILADA ZUCCHINI BOATS! A tasty way to eat more veggies that the whole family will love! A fun alternative to a traditional enchilada with tortillas, making this a gluten free dish,and a tasty way to ensure we’re eating more veggies! 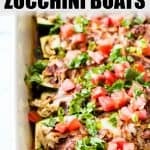 Zucchini Boat Chicken Enchiladas! Maybe my new favorite way to eat zucchini. 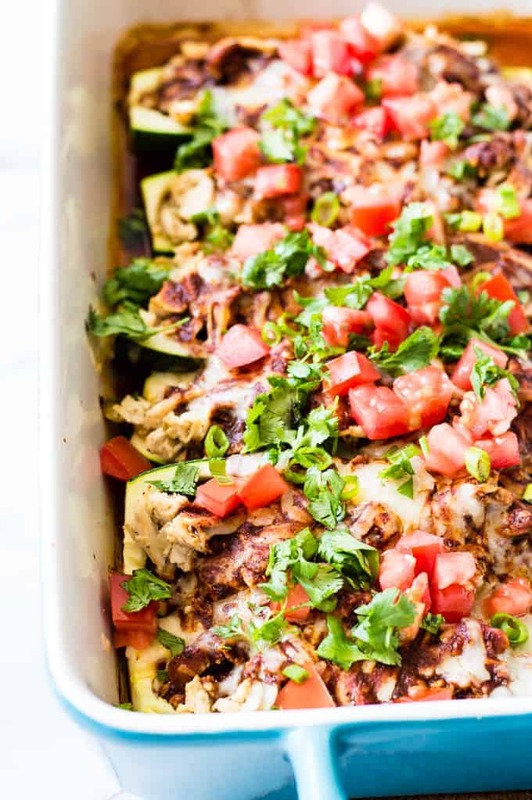 These zucchini boats are loaded with shredded chicken and cheese. 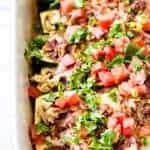 Topped with enchilada sauce and all the favorite toppings! What is a Zucchini Boat? Basically, we will be hollowing out a zucchini and filling it with our enchilada filling. We cut the zucchini lengthwise and then using a spoon scrape out all the seeds and create a boat shape in the middle. This makes it easy to stuff the zucchini with whatever deliciousness you want. Make sure you save the zucchini you scrape out too. Just toss that in a frying pan with a tiny amount of olive oil, some salt and pepper and you have a tasty snack! Not feeling the chicken? You can always substitute another meat in here. 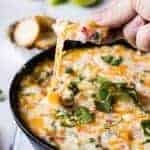 Or even just stuff the zucchini with cheese and some green chiles to make this meatless if you want. Or leave out the cheese and just have meat. Enchiladas are such an easy thing to change up. The most important part? The sauce. 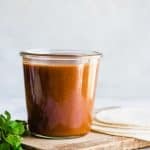 I love making my own homemade Enchilada Sauce. And of course theres the toppings. That’s probably my favorite part of any mexican style dish. Some of my favorites include: cilantro, tomatoes, green onions, sour cream. You could add olives if you want. Pretty much whatever you would put on your tacos you can toss on top of enchiladas. Make a batch of some Mexican Rice and Homemade Refried Beans and you’re all set! 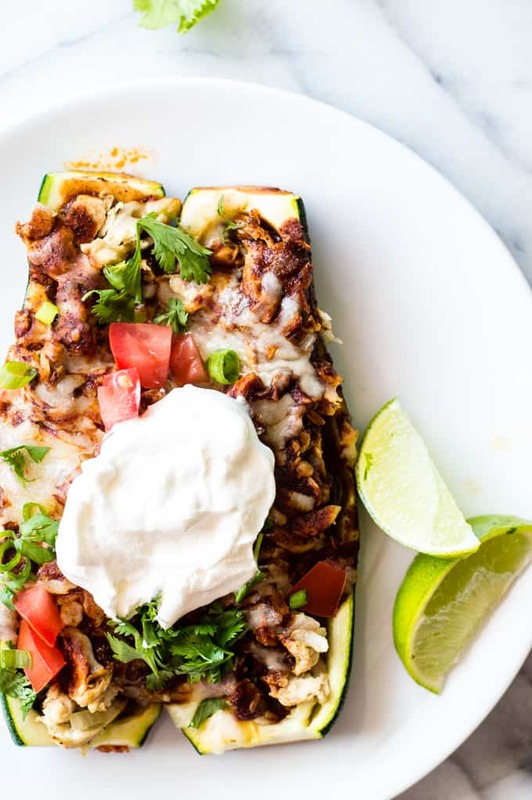 WANT TO TRY THESE CHICKEN ENCHILADA ZUCCHINI BOATS? 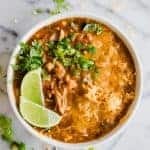 PIN IT TO YOUR DINNERS OR MEXICAN FOOD BOARD TO SAVE FOR LATER! Easy to make CHICKEN ENCHILADA ZUCCHINI BOATS! A tasty way to eat more veggies that the whole family will love! A fun alternative to a traditional enchilada with tortillas, making this a gluten free dish,and a tasty way to ensure we’re eating more veggies! In a large skillet heat the olive oil. Add the chicken. Sprinkle with the salt and pepper. Cook about 7 minutes on each side until chicken is fully cooked. Remove from the skillet and place on cutting board. Add the chopped onion to the skillet and allow to cook for a few minutes until the onion is softened and translucent. Remove from heat. Shred the chicken and place in a bowl. Add the garlic powder, cumin, cooked onion, green chiles, and 1 cup of the jack cheese. Stir to combine. Set aside. Cut the zucchini lengthwise and using a spoon scoop out the center of the zucchini leaving about a 1/4 inch barrier around the edge forming a boat shape. Spray a casserole dish with cooking spray. Line the zucchini in the casserole dish with the boat part facing up. Spoon the chicken and cheese mixture into the zucchinis. Pour enchilada sauce over the top. Cover the casserole dish with foil and bake at 425 degrees for 20 minutes. Remove the foil, sprinkle with the remaining 1 cup of jack cheese and continue to bake for an additional 10 minutes. Remove from the oven allow to cool for about 5 minutes, serve warm and enjoy! There is no other way to eat Zucchini! I have yet to make zucchini boats, I need to give it a try. This looks like the perfect way to start! The best way to eat zucchini!! I LOVE this recipe! What a fantastic idea, and a great way to make a delicious meal without the carbs, but still with all the flavor! 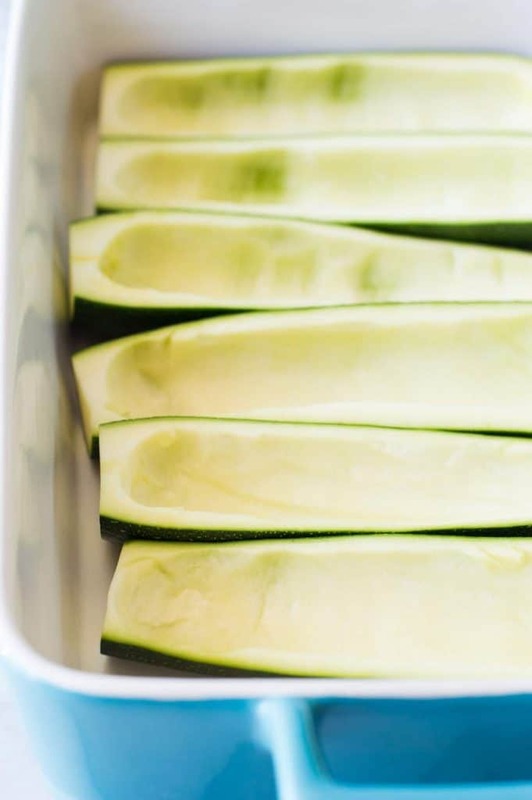 Zucchini boats – one of my favorite things about zucchini season! Loving this enchilada version. My family will surely love this! Looks SO scrumptious! I love zucchini boats! 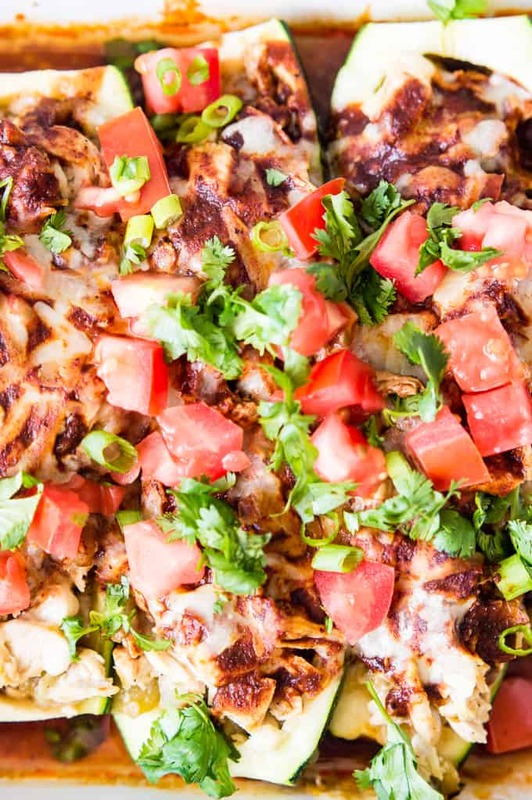 This enchilada twist sounds so good!